The Birthday Massacre is a Canadian dark wave and synth rock band currently consisting of Chibi (vocals), Rainbow (guitar), Falcore (guitar), Owen (keyboard), Rhim (drums) and Nate Manor (bass), that formed in 1999 (even though the 2016 demo collection "Imagica" dates some tracks back at 1998). 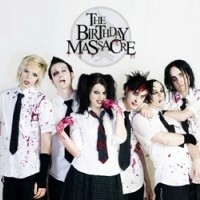 Originally known as Imagica, The Birthday Massacre is known for their playfully macabre and spooky tone, often created through the contrast of happy and upbeat melodies and dark and sinister lyrics. The band often uses primal fears, such as hearing footsteps, being afraid of monsters hiding under the bed and twisting innocent fairy tale motifs into something morbid. Musically, the band alters between light hearted 80's style new wave music consisting mainly of synthesizers and drum machines, and hard distorted guitar riffs and real percussion . More recent albums tone down the heavy rock elements and create a more surreal electronic sound. Another of the band's trademarks are their album cover artworks, all of them having a purple color scheme and eerie silhouettes, mostly of children and animals. The Birthday Massacre never had wide media coverage and only moderate commercial success, but nevertheless developed a devoted fan base. Their signature song is "Blue".